Hello and welcome to the 378th installment of the SWD. Turkey-backed Free Syrian Army and Turkish Armed Forces shelled YPG-held Tell Rifaat in northern Aleppo. Several sources claimed that Russian Military Police withdrew from the locality, which led to the Free Syrian Army and Turkish Armed Forces capturing it. However, these claims should be taken with a grain of salt for now. Commander of Al-Jaysh al-Watani al-Suri’s (Syrian National Army) Faylaq al-Thalith (Third Corps/Legion), Rami Abu Bahjat stated that Turkish Armed Forces’ delegation entered Tell Rifaat, in order to complete negotiations with Russia, which would lead to the Free Syrian Army capturing the locality. Abu Bahjat decided to state this, due to a large number of outlets claiming Free Syrian Army’s capture of Tell Rifaat and Russian Military Police’s withdrawal from it. Turkish Armed Forces announced death of two of its elements, due to an improvised explosive device in Afrin region. This announcement brings Turkish Armed Forces death toll in the operation ‘Olive Branch’ to 51 elements. Turkish Armed Forces also stated that 3755 elements of the YPG were “neutralized” since the start of the operation ‘Olive Branch’. Jabhat Tahrir Suriya (Ahrar al-Sham and Harakat Nour al-Deen al-Zenki) repelled Hayat Tahrir al-Sham’s attack on Maklabis village in western Aleppo. Reports suggest that six elements of Hayat Tahrir al-Sham were killed in the failed attack. Two Jabhat Tahrir Suriya’s commanders; Abu Walid al-Homsi (Khalid al-Ruwaishidi) and Naif Hamatu were also killed in the attack on Maklabis. Abu Walid al-Homsi was a prominent commander of Harakat Nour al-Deen al-Zenki, who defected from the Syrian Arab Army and fought in the battles south and west of Aleppo against the Syrian Arab Army. Another Jabhat Tahrir Suriya’s commander, Yousef Shahoud was wounded in the attack on Maklabis and was reportedly transferred to Turkey for treatment. 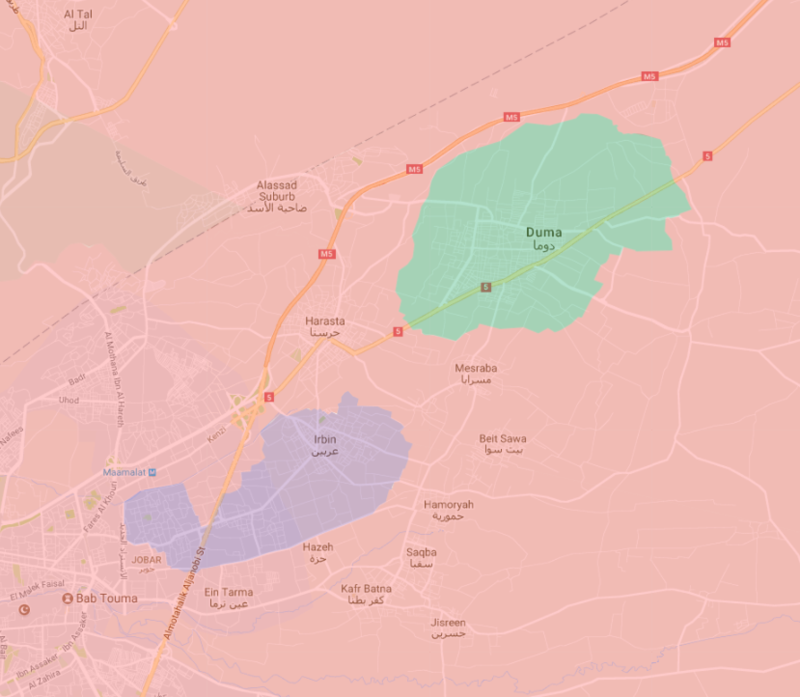 Mutual shelling between Jabhat Tahrir Suriya and Hayat Tahrir al-Sham wounded three civilians in Darat Izza area. Rebel “guerrilla” group Harakat al-Qiyam officially claimed responsibility for the assassination attempt on the spokesperson of the Syrian Democratic Forces’ Manbij Military Council, Shervan Derwish in the city of Manbij two days ago. Harakat al-Qiyam ‘apologized for late clarification’ and stated that Derwish was assassinated because he “won” the poll by the group regarding the next assassination. Harakat al-Qiyam also denied rumors that Derwish was targeted with a sniper and stated that he wasn’t in hospital, but rather killed in the attack. Both Harakat al-Qiyam and Free Syrian Army’s Liwa Maghawir Ertughtul claimed responsibility for the assassination attempt on Derwish, and both stated that he was killed in the attack, while reports suggested that he was in a hospital. Left over Islamic State’s improvised explosive device killed a civilian in Adman village. Fourth batch of Faylaq al-Rahman’s elements and their families were evacuated from Arbeen in the East Ghouta to Idlib. Syrian Arab News Agency stated that 4183 individuals, including 1001 fighters were evacuated today. Syrian Arab News Agency also stated that 6749 individuals, including 1620 fighters were evacuated in total yesterday. Faylaq al-Rahman’s spokesman, Wael Alwan stated that most of Hayat Tahrir al-Sham’s elements, 240 of them, were evacuated from the East Ghouta towards Idlib, in the first and second batches of evacuations from Arbeen. Faylaq al-Rahman handed over 28 prisoners to the Syrian Arab Army in Arbeen. Syrian Arab Army and allies reportedly deployed its units in the East Ghouta around Jaysh al-Islam’s stronghold of Douma, in preparations for a military offensive if the group doesn’t accept evacuation. Demonstrations were held in Inkhil, demanding that Hayat Tahrir al-Sham evacuates its headquarters and exits the locality. Reports suggest that the locals in Inkhil demanded Hayat Tahrir al-Sham’s exit from the locality, in order to neutralize the locality from the fighting, as rumors suggest that the Syrian Arab Army is preparing to launch an offensive in the region. Iraqi Security Forces conducted operations in Al-Khudair area, south of Baghdad. Security forces found five improvised explosive devices and a 60 mm mortar round. Several wanted individuals were also arrested in the operations. Islamic Emirate of Afghanistan ambushed and killed Afghan National Army’s commander Alam in Qalandar Bazar area of Chilgazy district. Islamic Emirate of Afghanistan assassinated Afghan Local Police’s commander Zahir and another element of the police in the city of Kunduz. One element of the Afghan Local Police was also wounded in the encounter. Islamic Emirate of Afghanistan raided Afghan Local Police’s checkpoint in Masjid Sabz area of Sang Charak district, killing two and wounding one element of the police. Islamic Emirate of Afghanistan’s improvised explosive device killed three and wounded two elements of the Afghan National Army in Dawlat Shah district. Islamic Emirate of Afghanistan raided Afghan Local Police’s post in Bati Kot district, reportedly killing one and wounding two elements of the local police. Islamic Emirate of Afghanistan’s improvised explosive device targeted Afghan National Army’s tank in Khogyani district. One element of the Afghan National Army was killed and three wounded in the explosion. Islamic State killed an element of the Islamic Emirate of Afghanistan in Chaparhar district. Islamic Emirate of Afghanistan’s improvised explosive device destroyed Afghan National Army’s vehicle in Saydabad district, killing one and wounding two soldiers. Afghan National Security Forces wounded two elements of the Islamic Emirate of Afghanistan in Musa Khel district. Islamic Emirate of Afghanistan raided Afghan National Army’s checkpoint in Qul Ustaz area of Muqur district. Two elements of the Afghan National Army were killed and one wounded in the raid. One element of the Islamic Emirate of Afghanistan was also wounded in the encounter. Afghan National Security Forces killed one and wounded three elements of the Islamic Emirate of Afghanistan in Muqur district. Islamic Emirate of Afghanistan attacked Afghan Local Police’s post in Deh Yak district, reportedly killing five and wounding two elements of the police, as well as destroying a tank. Similarly, Islamic Emirate of Afghanistan attacked Afghan National Army’s post in the city of Ghazni, reportedly killing four and wounding three soldiers. Islamic Emirate of Afghanistan’s improvised explosive device destroyed Afghan National Army’s tank in Qarabagh district, killing two and wounding three soldiers. Afghan National Police’s element surrendered to the Islamic Emirate of Afghanistan with his weapon in Waghaz district. Afghan National Security Forces killed 12, wounded seven, and arrested 14 elements of the Islamic Emirate of Afghanistan in Khaki Safed, Bala Buluk, and Bakwa districts. Afghan National Security Forces killed six and wounded two elements of the Islamic Emirate of Afghanistan, as well as destroyed two bases, two motorcycles, and several weapons depots and ammunition caches at the outskirts of Tarinkot. Islamic Emirate of Afghanistan launched a large offensive against the Afghan National Security Forces in Khas Urozgan district. According to the reports, Islamic Emirate of Afghanistan captured two checkpoints and killed and wounded more than 20 elements of the Afghan National Army and Afghan National Police. Islamic Emirate of Afghanistan attacked two Afghan National Army’s checkpoints in Dado and Shahwali areas of Arghandab district. Ten elements of the Afghan National Army were killed in the clashes for the two checkpoints, while one element of the Islamic Emirate of Afghanistan was killed and two wounded. Islamic Emirate of Afghanistan also destroyed an armored personnel carrier and seized five assault rifles, a PK machine gun, and two RPG launchers from the checkpoints. Afghan National Security Forces killed four, wounded three, and arrested three elements of the Islamic Emirate of Afghanistan, as well as destroyed two vehicles, three motorcycles, 27 fighting positions, and 12 improvised explosive devices in Jerashk district. Islamic Emirate of Afghanistan attacked Afghan National Army’s positions in Namro area of Nawa-I-Barakzayi district. Three elements of the Afghan National Army were reportedly killed and an element of the Islamic Emirate of Afghanistan wounded in the encounter. Islamic Emirate of Afghanistan’s snipers killed six elements of the Afghan National Police and Afghan Local Police in Nawa-I-Barakzayi and Nad Ali districts. Islamic Emirate of Afghanistan’s snipers killed three elements of the Afghan National Army at a checkpoint in Kala Shamir area of Maywand district. Islamic State killed one and wounded one soldier at the Faculty of Arts in Khormaksar directorate of the city of Aden.